...with a pretzel crust! OMG! Oh Bites is does it again!! 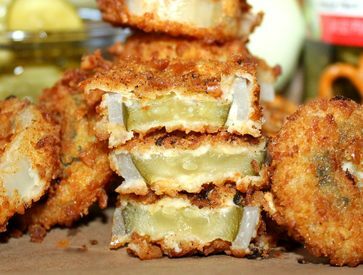 They magically morphed two of the most popular crispy-fried foods known to mankind... fried pickles AND onion rings! Why not? It’s almost like that hole in the center of the onion ring was made for a tangy slice of pickle. Top it all off with a crunchy pretzel coating, and NOW the good times can begin!